This is the story of little raindrop spirits on their journey to reforest a wood in the aftermath of a big fire blaze. It's your task to guide him through the forest, collect and plant seeds and see the forest regrow. Some plants can even be used as bridges to other areas of the forest. Throughout your way, you will meat other droplings, make sure to listen what they say as some might even help you on your journey. Finally, in the end, you might even get the chance to see the forests spirit himself. so, the last day is almost over. I gave it my best shot to get anything fixed and working as good as possible, though somehow it didn't work out as expected, I can't provide working installers for all platforms. Actually, I could only provide tested and working installers for Linux systems, but that won't satisfy my need for completion. Hence I stay with the already uploaded p3d file and as it turned out that might not work on windows because of some mysterious errors I never had before with those kind of files (well, I already imagined windows will make problems, as it always makes problems... can't expect things to instantly work on windows, can you? ), I added a packed version of the source code, which was tested and proven to work on windows and instructions for how to run it just in case the p3d file doesn't work. Also make sure to follow the steps and information given in the readme files and in the projects entry description, then everything should run and be as simple as a one click installer, after all it's always just one installation and running a file no matter which way you take. Anyway, if you encounter any errors or if it won't work for you for some reason that I don't know yet, just let me know and I'll try to get it fixed. Now, all that's left to say is, have fun with the game. P.S. If I get installers and or the p3d file to correctly work on my windows test systems, I will also make this game available from our website Grimfang-studio.org where you can check for updates if we continue our work on this game after PyWeek has officially ended. Though, that might depend on how many of you like to see it getting improved and grow from it's current state. well, so far the game is done, at least there isn't much that I could add to it in the less time that's left. If I get some time for it tomorrow, I'll look some more into creating installers as currently the packed installers only work for Linux (Debian based) but somehow not for windows. Anyway, the already uploaded P3D file should run on every mayor desktop system with only a few little caveats like having to install the p3d runtime and no fancy mouse cursor image on windows systems. So for the best experience with it I recommend trying it on Ubuntu GNU Linux. The game got quite a big step towards a release, many things have been fixed and the visuals were enhanced where necessary. The Core gameplay as well as some extras are done now and it actually is in a playable state now. The coming days will be used for bug fixing, fine tuning and enhancing the already existing things. The bad news though is, that mj-meo-dmt had to leave the team as he didn't got to spend as much time on this project as he wished he could in the first place. Anyway I'd like to thank him for anything he has done for me and this project! Today we added quite a lot again to our game, especially things that make it fun to play, like graphics for the games story and some small Easter eggs. Will you find them all? Some of the Easter eggs will also give you extra points. Aside of that we also keep an eye on little details and bug fixes. We also created a manual PDF with more details about the game and it's back story. Over the coming days we try to enhance our core gameplay and fix the remaining bugs that we are aware of. The week's almost half way through already! Today we implemented most of the main gameplay of our game. Planting seeds to earn points and place vein bridges to get to new areas and give the forest some new life. 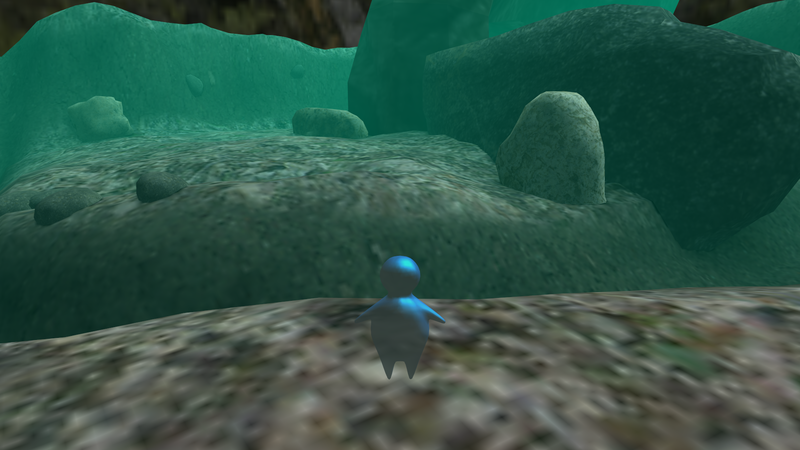 To make it a bit more strategical, you need to take a look at your bodies amount of water to get to the end of the forest without loosing all the water your body is made of as a rain spirit. 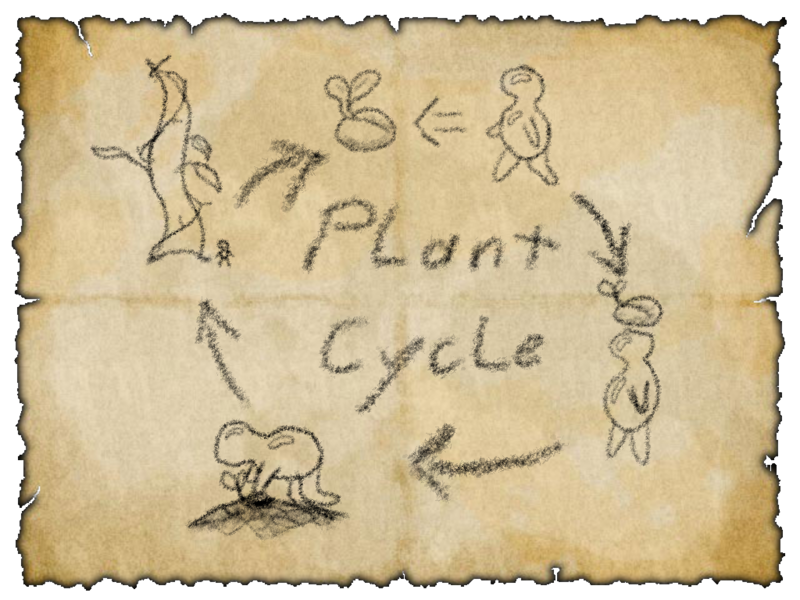 Here's a little image of how the planting and growing cycle works in our game. 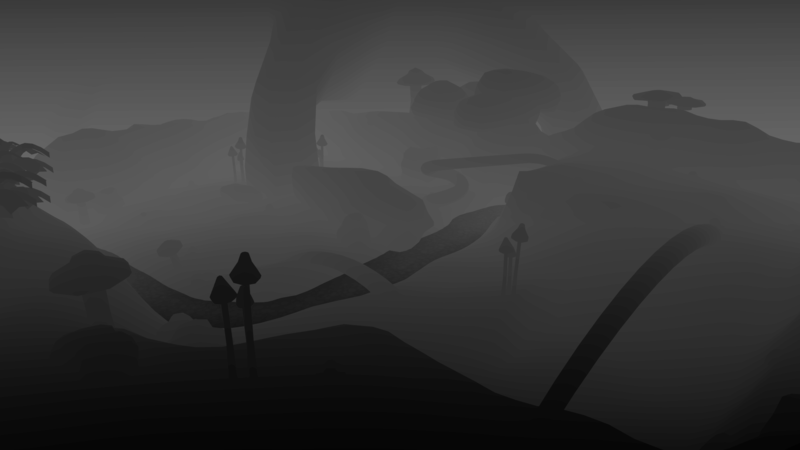 The development of our core gameplay has started and we already made some good progress on it. But there's still quite a lot to do, especialy on making the game fun to play, even though so far it looks quite good. We're confident that we will get this done in time, until now we're still in time with our plan we laid out for this week. Here's a screenshot of the current main menu. You may notice it's translated, at the moment our game is available in English as well as German and will use the "default" language set in your system. We also successfuly tested our deployment cycle so we'll be ready when the big day comes. Don't forget to test your deployment cycle early. You don't want to get surprised by a not working game release, would you? This was a successful day 1. Starting early in the morning, we got the skeleton and some basics of our game up and running and now we can head on to the real work. In the coming week we will try to create a game with all the goodies one would expect from a complete game to create a nice experience for you, the players. 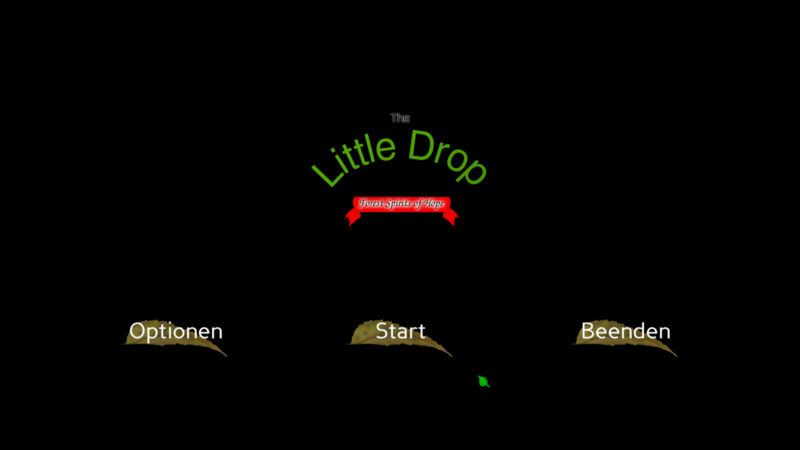 "The Little Drop" as we call it, will be an adventure puzzle game about a little forest/water spirit which you get control over. Your mission is to grow new plants after a big fire has burned down most of them. We have a lot of ideas for features for it and we'll try to implement as many of them as possible. To be able to implement many features we will mostly use assets from websites like OpenGameArt.org and the like and concentrate on coding and fitting all the assets we find together. We'll keep you updated on the implemented features and general status of the game as we proceed. Now all that's left to say is, we wish you all a happy coding week and may you all create great games.